The Chromatography Division (Chromsa) of The South African Chemical Institute (SACI) and KwaZulu – Natal SACI Section invited all postgraduate students to participate in the 2019 Postgraduate Research Colloquium, at the Durban University of Technology, Ritson Campus, recently. The colloquium is used as an opportunity to allow the postgraduate MSc or PhD students in the discipline of Chemistry within their respective KwaZulu – Natal universities or universities of technology, to speak about their research to department faculty and students, as well as other guests from around the University. Also, the purpose of the colloquium is to share the postgraduate researchers’ research and provide constructive peer feedback in a collegial environment as part of building a vibrant interdisciplinary research culture. Research presented at the event marks a key milestone for the students, who go on to present their projects at academic conferences and publish their findings in prestigious academic journals. Several awards were also conferred at the end of the event. Welcoming guests to the event was DUT’s Department of Chemistry’s Professor Krishna Bisetty, who added that the event was not just a platform to showcase research of Master’s and PHD students but it was also a proud moment for DUT since researcher, DUT’s Senior Lecturer: Dr Lawrence Mzukisi Madikizela, received the prestigious Chromatographer of the Year 2018 Award. The award is given to the nominated person who has made the most significant contribution in the field of Chromatography during the last two years. He also added that when he had completed his PhD, he had told himself that he must get this award one day as a way of appreciating the efforts, ideas and guidance from his PhD supervisor (Prof Luke Chimuka from Witwatersrand University). He would always be thankful to his family, Prof Luke Chimuka, friends and students that encouraged him and worked hard to ensure that his dreams can become a reality. Guest Speaker at the event was Professor MM Nindi – University of South Africa (Chemistry Department) and Analytical Chemistry Division Chair of SACI. He delivered his presentation on the journey of Mass Spectrometry to a Marriage with Liquid Chromatography. He explained that Mass Spectrometry (MS) is an analytical technique that measures the mass-to-charge ratio (m/z) of charged particles (ions). He spoke about the journey of Mass Spectrometry and the first instrument to provide mass spectra comparable to today’s example, as well as delved into the Gas Chromotography – Mass Spectrography relationship. “Gas Chromotography is a very powerful separating technique that separates volatile compounds and Mass Spectrography is a powerful detection technique,” he said. The stressed that the electron ionization mass spectra obtained are reproducible and suitable for library, making them more amenable to analysis by positive electrospray and GC / MS is now a robust and very widely used technique. DUT’s Phathisanani Hloma, Nomchenge Mlunguza and Edward Armah were some of the students who gave 15 minute presentations as well. 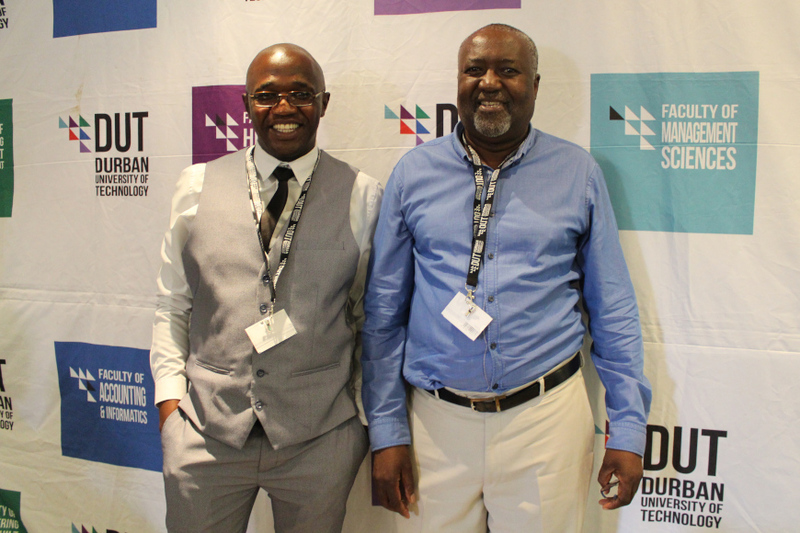 Pictured: DUT’s Senior Lecturer: Dr Lawrence Mzukisi Madikizela, winner of the prestigious Chromatographer of the Year 2018 award, with guest speaker at the event, Professor MM Nindi – University of South Africa, at the event.